Well, okay, technically I’m taking a plane, but still! Today I’m off to Boston for a week of fun and shopping before Rhinebeck next weekend. And guess what? Yeah, I started another Rhinebeck sweater. This Rhinebeck thing is a great motivator! 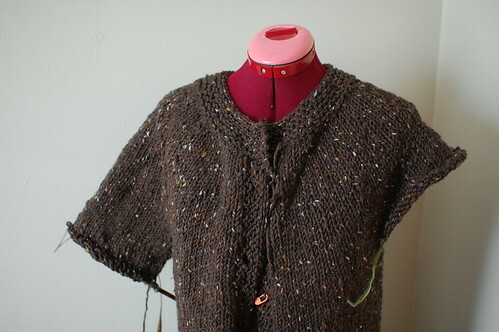 Last March or so I knit a top-down, circular yoked sweatercoat out of double stranded Cascade 220. I’ve been wearing it all the time, but it has 3/4 sleeves – it’s actually been a bit chilly here, so I decided it was high time for something with full length sleeves. And for once, the chunkiness of the yarn was actually appealing. I used Debbie Bliss donegal chunky tweed – not the softest ever (not as soft as the Cascade) but not bad. 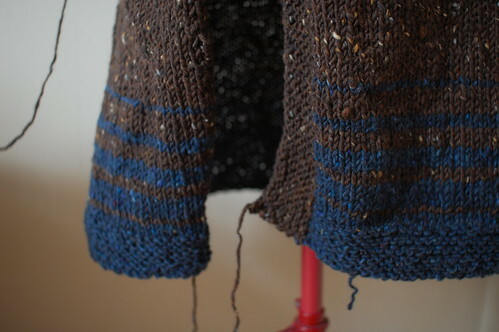 I only had 8 skeins of the dark brown, plus 2 blue, so I incorporated the blue into the bottom of the sleeves and body. I finished the second sleeve last night under the wire, so now I just have to sew on the buttons! I washed and blocked everything but that second sleeve at my parents’ house on Thursday, since I could use their washing machine to spin it out. Sigh, I miss on-demand laundry. I hear Boston’s a bit warmer than here, so maybe I’ll get away with just the sweater for most days there. I know Rhinebeck is pretty chilly in the evenings, so a coat might be necessary too. Oh, and I’m doing a book signing at Rhinebeck! On Sunday in the author’s tent, from 1-3pm (I think?). I’ll have all the sample socks from the book and I’ll just be hanging out, so come by and see me! Gotta go. The plane awaits! Oh dear. I’m not a chunky yarn fan, but that chocolate tweed is to die for. And it’s about time I knit a top down sweater. That’s a very clever way to use up two different colors of yarn. mmm- that brown and blue look great together! The chocolate tweed is the ultimate fall yarn, I’m hooked on the ‘tweeds’ and the color combo is perfect. What a great idea to incorporate your blue skeins in! Love the brown chunky tweed, hope it keeps you warm! I’ve been thinking of how to use two colors of DB Chunky Tweed in a sweater and you came up with the perfect solution! Please publish the pattern and let us see the finished product. Lovely! Beautiful – blue and brown for the win!